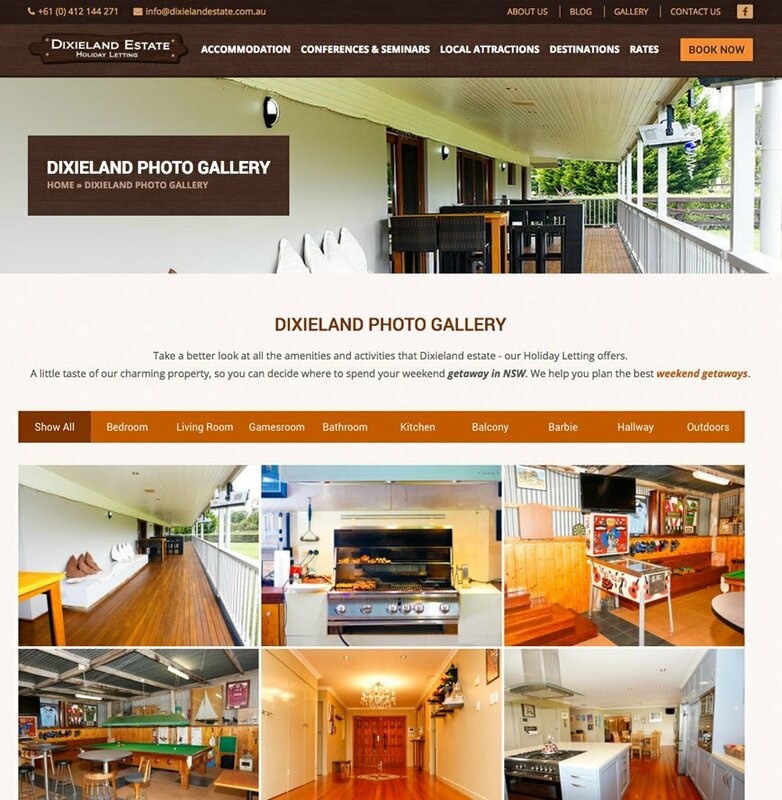 The Dixieland Estate is located at the heart of the beautiful town of Berrima in the Southern Highlands of New South Wales. It is a magnificent 27 acre property that exudes warmth and features the charm of the native Australian influence perfectly blended with a touch of modern ambience. It’s a pleasant one and a half hour drive from Sydney and is an ideal destination for your next event, vacation or a quick getaway. The client had a perfect holiday letting, but had no online means of renting it out. This picturesque property is set on a rolling landscape and made a perfect Southern Highlands accommodation for those looking for something different from the regular resorts and pricy hotels. 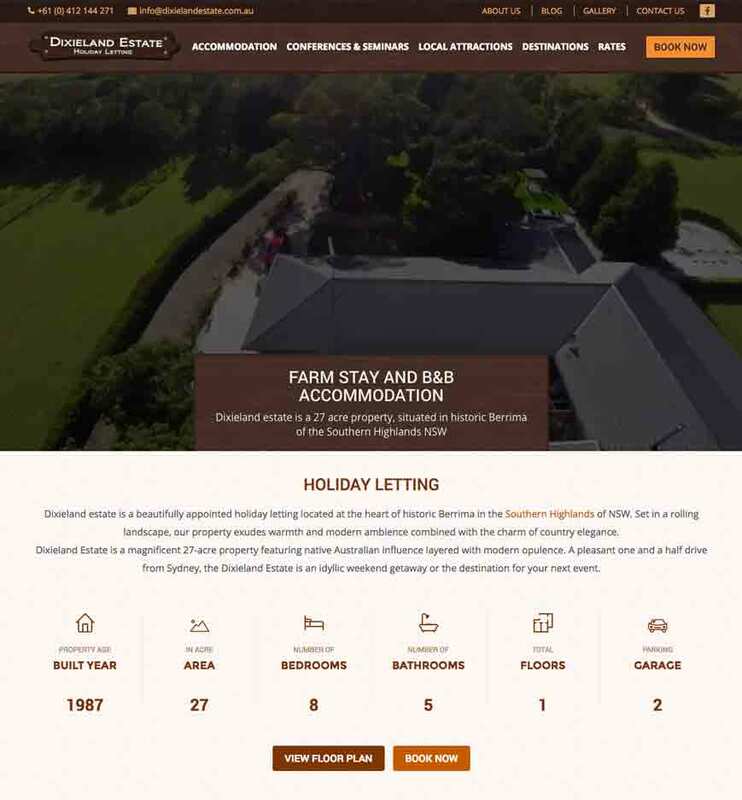 The client wanted a website where customers could book the holiday home online and also get a little more information about the local attractions and sightseeing options. A new website that matches the scenic property. The website should also hold information about the local attractions and specialties in and around the property to trigger an interest in those looking for a Southern highlands rentals. The site should be responsive and should render well on the mobile devices of all sizes. After evaluating the customer’s requirements, Pulse team proposed a CMS based solution using WordPress. This made it easy for the customer to add, remove or edit content easily. The site was also made responsive so that mobile users could conveniently access its content via smartphones of all screen sizes. 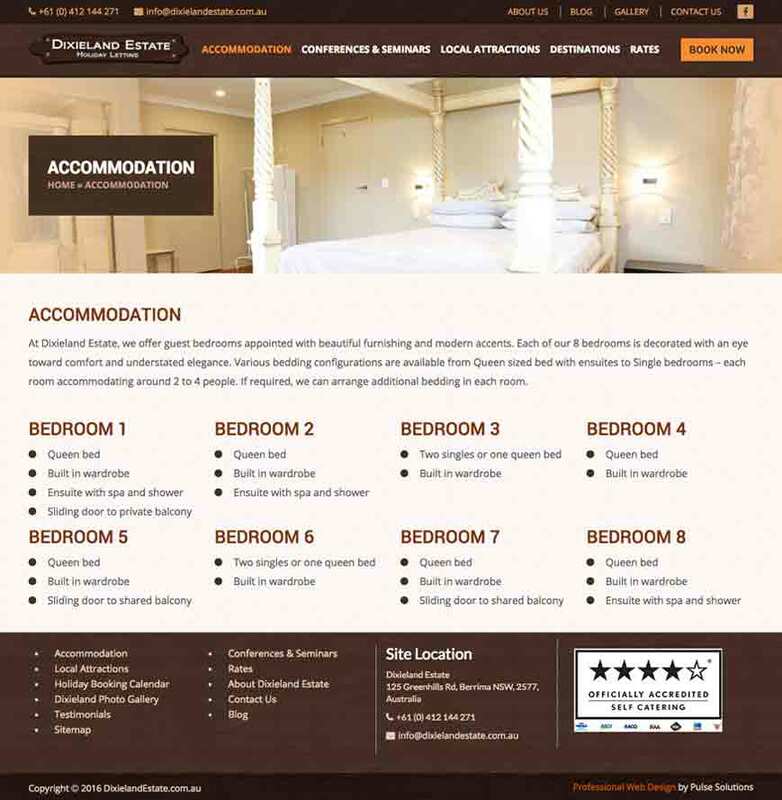 Created a new website that enabled the client to rent out his holiday home. WordPress was used so that customer could edit the content without too much technical support. The website was made responsive using the latest versions of HTML and CSS. Features for online booking requests were added. The site also shows local attractions, accommodation facilities, room details and rates. As a result of the new website designed and developed by Pulse Solutions, the client saw significant increase in bookings and leads. Customers could conveniently make holiday bookings for the estate by checking out the rates and the availability of the rooms. The use of WordPress made it easy for the client to change the content. The website was made responsive so that mobile customers could have easy access to the content. The SEO friendly features helped improve the online presence of the website. The website was completed within a short span of 20 days. If you are looking at a new website for your business with all the latest features and trends, let’s talk about how we can do it together. Contact us today.